We offer a supportive working environment that promotes individual growth, teamwork, and creativity. 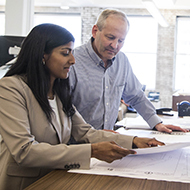 At Meyer Borgman Johnson, your ideas and dedication to your field are valued and rewarded through a competitive salary, generous benefits, and personal recognition. You will find opportunities to work with a wide variety of building types and structural systems. Because continuing education is an important component of engineering, our working environment is infused with learning opportunities.